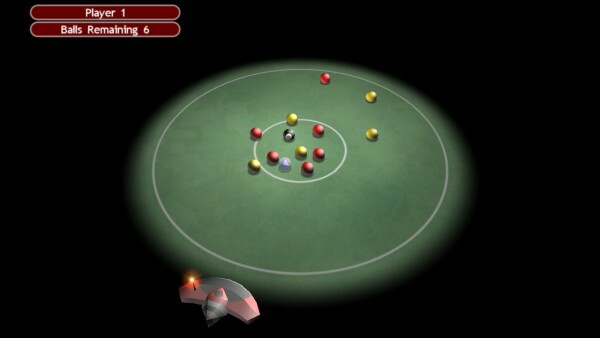 Future Pool is a new fast paced video pool game. Classic 8-ball pool on a circular table with no pockets. Like bar pool, players take turns to shoot the cue-ball and pot the red or yellow balls, then the 8-ball. Unlike normal pool you only have to push the balls to the edge of the table to pot them. Future Pool is a more dynamic and exciting game than normal pool. With no pockets and no fouls, multi-ball pots are common but the 8-ball is as dangerous as ever if you sink that without potting your balls first. Play against the computer or up to six friends in Kalbooki league tournament. Choose from four table layouts and sixteen different A.I. personalities from Box Car Bob to world Future Pool champion Jace "The Ace" Stockwell. Cornutopia Future Pool is a unique superior alternative to an ordinary video pool game. GameTunnel (Review Extract): "This game become addictive very quickly. Currently, I have completely stopped playing anything but the arrangement with the three 8-balls because it poses the greater challenge. Ultimately, what keeps this game fun is the challenging computer opponents and the three 8-ball arrangement." GameXtasy (Review Extract): "Future Pool is easy to play, fun and addictive. My son and I have spent many pleasant hours competing against each other. You don't need a lot of time to get into the game, though. Give Future Pool five minutes, and there's a good chance it'll earn a permanent place on your desktop." Not currently available but a new version is being planned.